Data from an independent, placebo-controlled, “gold standard” clinical study indicates that the use of the supplement, FertilAid for Men, resulted in marked improvements in male fertility and sperm health. Specifically, the results of this important study reveal that taking FertilAid for Men significantly increases “total normal sperm motility” – with a tendency toward an “increase in total mobile sperm count”. Conducted by reproductive endocrinologist, Dr. J.E. Ellington, and pharmacologist, Dr. G.D. Clifton, the randomized, double-blind FertilAid for Men study was conducted through 2006 over a three month period to determine the effects of FertilAid on men with ‘”abnormal sperm parameters”, as defined by the World Health Organization. View the complete FertilAid for Men Study as published in the American Society of Andrology’s Annual Proceedings 2009, pg 41. The results of the FertilAid study revealed a “significant improvement” in the number of motile sperm, or “total normal sperm motility”. A defining characteristic of sperm health is sperm motility – or the ability of sperm to move in a progressive, unidirectional manner. Motile sperm display the capacity to swim in a sustained, forward-moving fashion. Importantly, motile sperm also exhibit an increased ability to fertilize an egg. Non-motile or abnormally-motile sperm, on the other hand, show a decreased capacity to cause fertilization (or pregnancy). In determining healthy sperm function, the “total normal sperm motility” is a fundamental aspect or “parameter” for defining fertility health in human males. The FertilAid for Men Study results indicate statistically-significant improvements in sperm motility for subjects using the dietary supplement. 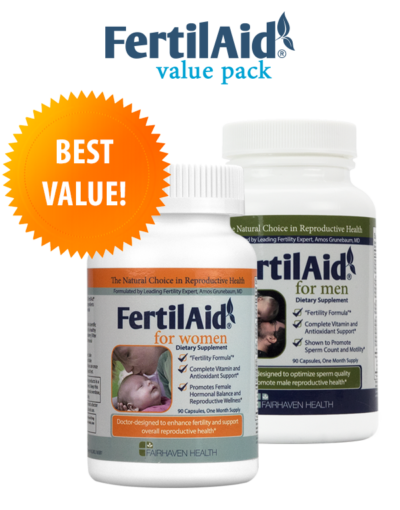 Study designer, Dr. Ellington, also suggests that the use of FertilAid for Men may improve sperm count. 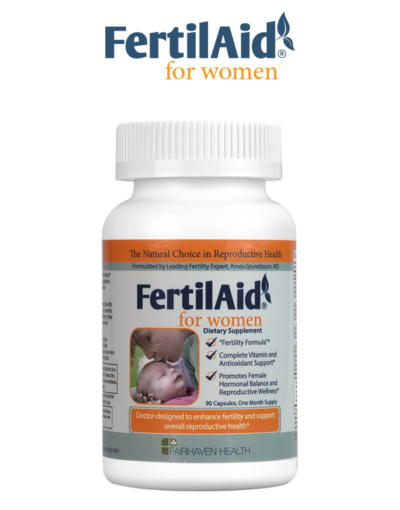 The FertilAid study showed a tendency toward an increase in total mobile sperm count, which corroborates previous independent studies focusing on specific ingredients contained in the FertilAid for Men formula – particularly various antioxidants and the amino acid, L-Carnitine. Results of the FertilAid for Men study revealed a “significant improvement” in the number of motile sperm, or “total normal sperm motility”… suggesting an increased odds of pregnancy. Formulated by Amos Grunebaum, MD, FertilAid for Men is a non-prescription dietary supplement that combines a potent array of vitamins, antioxidants, and a blend of herbal ingredients, as well as the amino acid, L-Carnitine. 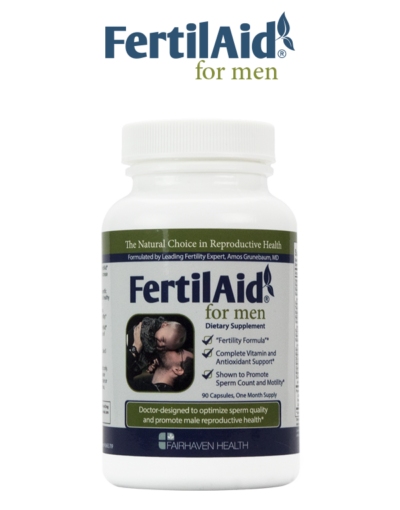 In addition to this recent FertilAid for Men study, other independent clinical data suggests that the ingredients in FertilAid may enhance sperm health in several vital categories, including overall sperm count, sperm motility, and normal sperm morphology. In particular, scientific literature suggests that antioxidants (contained in vitamins) can improve male fertility by reducing oxidative damage to sperm, while enhancing key functions of the seminal plasma which both protect and nourish sperm. In various independent studies, antioxidants have been shown to reduce “free-radical” damage while increasing overall sperm integrity. Studies on the amino acid, L-Carnitine, display equally exciting results. L-Carnitine has been shown to support sperm metabolism, or the capacity of sperm to transform complex molecules into energy. L-carnitine has been shown in a number of clinical studies to enhance several fundamental sperm parameters, including sperm concentration, motility, and normal morphology. This is good news for couples who are aiming for a pregnancy! And while the FertilAid for Menclinical study indicated marked improvements in sperm quality for men with “abnormal” sperm parameters, Dr. Grunebaum emphasizes that FertilAid for Men is designed for all men seeking to ensure optimum sperm health while trying to conceive a baby. Read more about clinical data on FertilAid ingredients – and how FertilAid for Men works to improve sperm quality and male fertility.